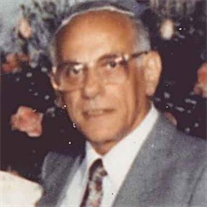 My father, Herman Lengel, passed away on Friday, on his birthday, at age 97. Here is the eulogy I wrote for his funeral on Sunday in Oak Park. Herman Lengel didn’t accidentally end up in Detroit, one of more soulful cities in the country. His soul was deeper than the Grand Canyon. He was full of heart, sincerity. He was extremely generous. There was no pretentiousness, no b.s. 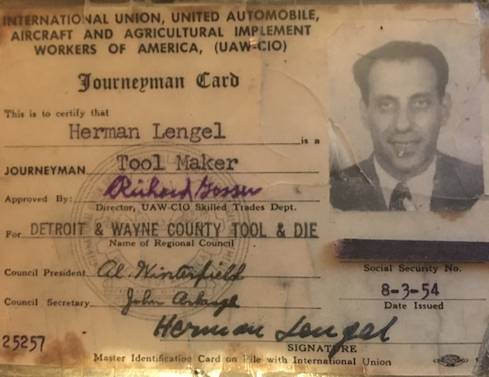 He was a Holocaust survivor, a tool die maker at the Fleetwood Plant in Detroit and he owned different bars at different times in the 1960s, the last one being the Strand Lounge at the corner of Grand River and 14th Street. It was around the corner from the 20 Grand Night Club where big names like the Supremes, Stevie Wonder and B.B. King performed. My father’s place had bands on the weekends and would get the spill over from the 20 Grand. Sometimes the janitor showed up hours late, so I’d put up all the chairs on the tables, sweep, mop and wax. On at least one occasion, I recall, he paid the janitor even though I did most of the work, then said: “My son did a lot of your work.” The janitor handed me a few dollars. At noon when the place opened, we’d go next door for a shoe shine at a place that also doubled as a blind pig, a place that illegally sold alcohol. Herman was on the quiet side and refined, but he mixed well with everyone. He seldom drank. He rarely swore. He was a true gentleman. He often left a big tip at the shoe shine joint, and would say,”buy everyone a drink.” Then add: “At my place,” meaning not at the blind pig. Afterwards, we’d go for lunch. My father loved watching the news. Every night for 90 minutes he’d watch a half hour of local news, then NBC Nightly News at 6:30 and then ABC News at 7. He also read the local newspapers and was avid reader of U.S. News & World Report. I figured that’s where I got my hankering for news. It was out of a Seinfeld episode. OK, a diet coke,’I said. “Nothing for me,” I said. “Ok, Jello with whip cream,” I said. My father was a solid Democrat. My mother was, for the most part, but in 2004 she was thinking of crossing over. George W. Bush was running for re-election against Sen. John Kerry. I was living in Washington and called home. My mother started to tell me why she didn’t really like Kerry and was thinking about voting for Bush on her absentee ballot. I tried to convince her why it would be bad idea. After speaking to her, my father got on the phone. He was fearless. And faced many challenges. Old age was one of them. In his 90s, after my mother passed, he came to the Meer apartments in West Bloomfield. But he fiercely kept his pride. For a while when he started to use his cane to walk down to the dining hall, he would hand the cane over to the caregiver just before making his entrance in the dining room. I had the good fortune of spending a lot of time with my father after my mother passed, and I always felt the love. He also got a lot of great care and love from the caregivers, who treated him likely family. I know my brother already thanked them, but again I’d like to thank the caregivers: Cheryl Beckman, Audrey Johnson, Akila Powell, Denise Hawthorne, Jasmine Strickland and Helen Adams. Also, he got great care from the Hospice nurse Alice Powell, who was also my mother’s nurse in 2011. And we also had plenty medical advice from family friend and nurse Rose Fenster. The rest of my family, my sister, my brother, his wife, also helped regularly to care for him. My memories are of a loving father, who was supportive, generous, believed in me and set a great example of what it means to be a man.